O’Fallon Township and William Mason are the two newest regional champions, winning Bands of America regional competitions this weekend in Clarksville, Tennessee, and Bowling Green, Ohio, respectively. 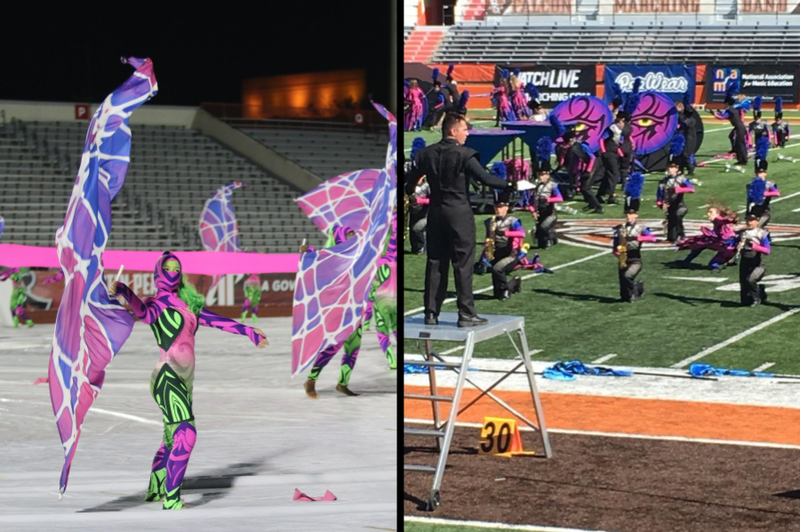 O'Fallon Township (left) and William Mason (right) perform at BOA regionals in Clarksville and Bowling Green on Sept. 29, 2018. // Photos courtesy of Greater St. Louis Marching and William Mason Band Boosters. This is O’Fallon’s second regional championship, winning the Clarksville Regional that last time the band attended in 2015. O’Fallon also won caption awards for music performance and general effect and tied for visual performance. Second-place Franklin tied O’Fallon in visual performance and also received the top placement in visual effect. Castle and North Hardin finished just a tenth apart in third and fourth places. Castle won the regional the last two years. William Mason’s win in Bowling Green also earned them additional honor of sweeping captions, earning awards for music, visual, and general effect. Mason is also no stranger to winning, this being their sixth regional championship. The band has previously won regionals in various cities across Ohio and one in Michigan. Brownsburg and Lakota East finished second and third, separated by just a tenth. These two bands will go head-to-head in just a few weeks at the Indianapolis Super Regional. Lakota East made history at that event last year when they made finals at a super regional for the first time, while Brownsburg fell out of finals in 2017 after placing 11th in 2016. Maybe this year, both will be performing in finals for the first time. You can dig into full ordinal recaps from all of this weekend’s events on our results page.